So, today's entry really should be about the gajillion awards I'm hoarding (Thanks everyone! I'm honored!) -- but I have a gajillion and three tabs open right now and half of them are about bull leaping from the Minoan to the Modern, and if I don't write this entry they're going to keep staring at me for days. Unlike my usual research topics, this one isn't a direct result of one of my books. The Bull Dance has been on my mind, however, ever since I read Mary Renault's The King Must Die which spends a significant number of pages chronicling Theseus' life inside the bull ring during his time on Crete. She takes some artistic license with the Minotaur, and has a really fascinating interpretation of the labyrinth, but this isn't meant to be a review of that work, so I'll skip over the specifics for now. The other day I was surfing the web when I came across this news article. Apparently a matador was arrested for fleeing from his bull in the ring. Now, I'm not really pro-bull fighting. When it comes down to it, it's a highly ritualized animal slaughter for the entertainment of those in the stands. Since, as a culture, we seem to frown on ANY kind of highly ritualized animal slaughter, even those for religious purposes (you'll notice that religions which require animal sacrifice have been forced to the fringe of society over the years), I'm not sure why we're still allowing bull fights. BUT, we do. And having just finished the second half of Mary Renault's opus on Theseus, it occurred to me that this might be a remnant, passed down, warped, evolved, and inherited from the Minoan Bull Dance. From Wikicommons, a fresco of Knossos, Crete. Wiki dates it anywhere from 17th-15th centuries BCE. Mary Renault paints the Minoan Bull Dance as a cooperative showcase-- man and bull together in harmony. A team of men and women worked together to keep themselves alive in the ring while they leaped and allowed the bull itself to throw them into the air. The bull, after a time, would know the dance as well as the team. It was a performance of skill which required perfect timing and a relationship (I would even go so far as to say a relationship of TRUST) to the animal they worked with. There are no swords or spears featured in the information we have left of the Bull Dance, but there is plenty of evidence for acrobatics. In my next* post, I'll discuss the much more probable descendant of the Minoan Bull Dance-- and it isn't the Spanish Bull Fight. *next being kind of relative. I'm sure I'll get there eventually, though! 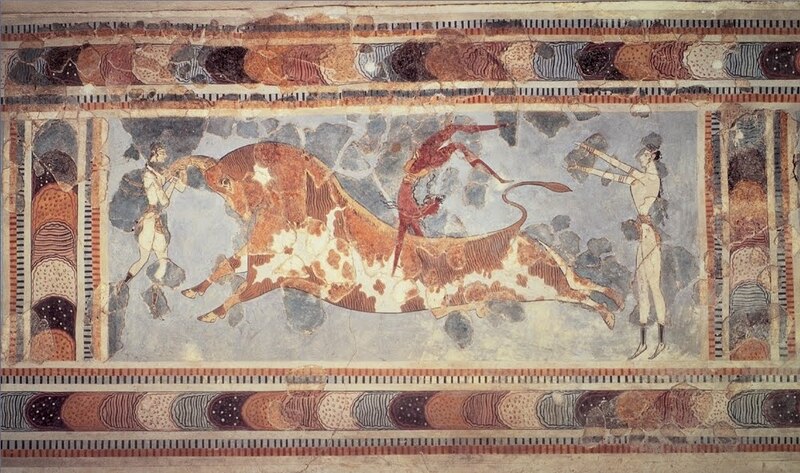 I think the Minoan Bull Dance is totally awesome, especially since it depicts women doing it. It's an interesting juxtaposition since women during that time period were pretty restricted. It definitely is awesome-- I just wish there were more information. I wish we knew more. Right now it's just sooo mysterious, and the information available just doesn't answer any real questions. Yes the Bull Dancing rituals of the Minoans have always intrigued me and I've read several Fictions depicting the various reasons for them. I kind of like how there are still mysteries like this to unravel. It lets the mind get really creative trying to weave your own stories. Superman is awesome. I hope he's in every museum in 3800 AD. Great post! I love to watch Matadors in the ring but can't bear the end result. The idea of a ritual dance that incorporates the grace and aerobatics, but leaves out the slaughter, is enthralling. Monica: it is mysteries like these in history which make me want to write books :) Perhaps I will give the Bull Dance a short story! Amalia, this is an awesome post. I am unabashedly awed an amazed by the Minoans on Crete and all of Ancient Greece. In my current WIP, as I said, there is a scene in which I've pulled a bit of Bull leaping into the Isthmian Games. Some characters fare well... others not so well. But I feel your geekiness over Ancient Greece with all your textbooks and research. And you're right, I struggled to find information on the bull leaping as well. So I took a bit of fictional license in my story. Thanks for sharing and I'm definitely one of your newest followers/ fans. if you liked this post you should check out the post I did on Mycenaean Clothing and Culture-- there's a link to an INCREDIBLE render of what the palace at Knossos (I think it was Knossos but it says for sure in the post) would have looked like. My jaw drops to the floor every time I look at it. Oh yeah!!! The Palace at Knossos was ridiculous!! I studied this piece in an art history class and it, like all of Greece and esp. Knossos, fascinated me. I'd say it's definitely a relationship with the animal-- they are all trained athletes in that mosaic. There's a similar practice with horses today called vaulting, and I imagine the Minoans enjoyed it for the same reasons we enjoy the modern-day equivalent: a beautiful showcase of athleticism and working alongside a powerful animal. Also, wasn't Crete renowned for its cows and bulls? That's where the whole Minotaur thing came from, if I remember correctly-- the queen er, fell in love with her prize bull and... well... those Greeks and their silly escapades. Yeah, the minotaur came from something like that. You are not wrong. Something to do with Poseidon. I'll have to look up vaulting! Thanks! I confess I'd love to get rid of bull fighting, and bring back bull dancing. Me too, Gary. I think it would require more skill and more guts. of course, I'm sure animal activists would still think it was abuse and whatever, for making the animal "Perform" but at least they wouldn't wind up being stabbed to death. I read this yesterday and couldn't think what to say because Amalia it was AWESOME. The bull dance sounds very interesting. It's a shame there's not more on it.